One of the things we like to accomplish near the end of the reception is a romantic and intimate night shot. When the night is coming to an end and the couple is feeling relaxed and at ease, we take them aside to find somewhere to get this perfect photo. When it gets dark, the atmosphere of a venue changes and gives opportunity for shots that we would not be able to capture during the day. This photo is taken at Graydon Hall Manor in Toronto, Ontario. 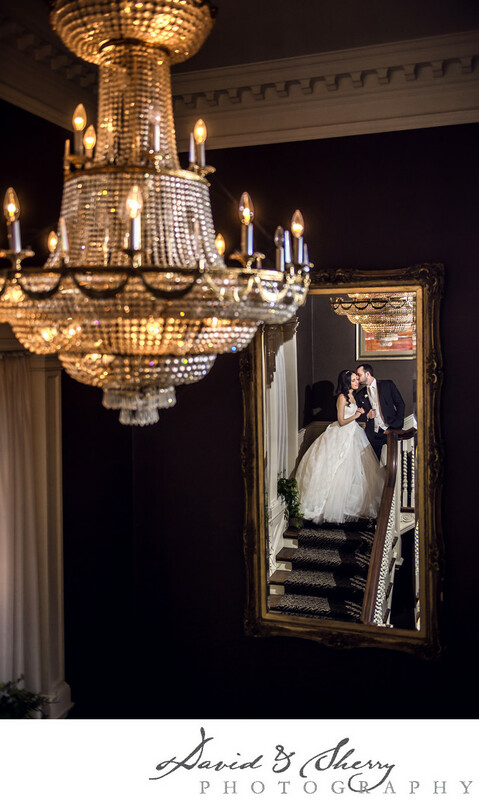 There is a grand staircase going leading down to the reception hall with a magnificent crystal chandelier reflecting off a giant antique mirror. Placing the bride and groom in this specific lighting and pose showed off the bride's gown, the love between a man and his new wife, and portrayed the mood that we wanted, creating this charming and tender image. Graydon Hall Manor is one of the best wedding venues in the Toronto area, and for good reason. This grand building, built in 1936 is elegant both inside and out. From the spectacular, colourful gardens and architecture, to the elegant dining and outdoor terrace seating, this location is the ideal place for two people to wed. All of the weddings we have seen here have been effortless and beautiful thanks to the accommodating staff and excellent facilities. This venue never fails to disappoint, especially in the area of wedding photography.